No profound musings today, just dessert - which is really the important part anyway, right? Combine all ingredients in large bowl. Let stand 1 to 3 hours. Oil 9 - 12 glass baking dish. Transfer filling to prepared dish. Sprinkle topping evenly over filling in dish, covering completely. Bake until fruit is tender, juice bubbles around sides and topping begins to brown slightly, about 40 minutes. If it doesn't brown enough, remove crisp from oven. Preheat broiler. Broil just until topping is crisp and golden, but WATCH CLOSELY!!! Transfer to rack and cool about 30 minutes. Oooh, it's just beautiful! Thanks for the recipe. I really outta break down and buy some rhubarb. I've eaten once or twice in pies that other people have made, but I've never worked with it myself. love me some 'barb. and yes, dessert is the most important meal of the day. really. that looks good. i've always been afraid of cooking with rhubarb because ain't it poisonous? i also like the banner too. Rhubard stems are fine, the LEAVES are toxic but not lethal to humans, containing high amounts of oxalic acid; but you'd need to eat about 5 POUNDS of them, cooked, to have any effect. Yes, dessert is the most important thing, especially if it's as beautiful as your crisp. I would have never thought of pairing rhubarb and plums, that sounds so nice. Rhubarb grows like crazy up where you are. The wife went to visit her sister in seattle and came home with a suitcase full of homegrown rhubarb. it is great in pies, but it is also great in a drink. boil a few stalks in water till they break down, then strain. Allow to cool, add lime and sugar and tequila, rhen you have yourself a rhubarb margarita. wait! bake at what temperature?? did i miss that bit? sorry if i did! Oh goodness! Bake at 375. Sorry, I'll edit. Oh, and I am sooooooo gonna try me a rhubarb margarita! yummieeeee! gonna try thos one, as soon as I got the right ingredients! I totally agree! I would take dessert over profound musings any day! I think it looks great. I will have to make this the next time we have some rhubarb. That looks AMAZING! 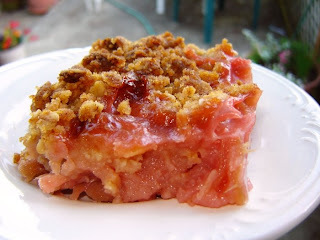 I always wonder what to do with rhubarb!